Both Steve and his wife Veronica were born and brought up in what was Rhodesia, now Zimbabwe, growing up through the trauma of the liberation war and the struggles of the newly independent Zimbabwe. After ordination in 1990 he was given the parish of the Lowveld in south eastern Zimbabwe, an arid rural area roughly the size of Wales. For 12 years he ministered to a diversity of congregations, from villagers hearing the gospel for the first time under their mango trees, to company executives responsible for multi-national interests in the area. 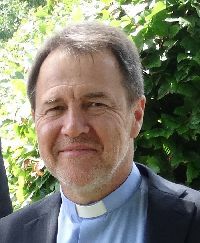 In 2002 he and Veronica felt God leading them to move their family to England, where for the last 10 years he has been the Vicar of the United Benefice of Lingfield and Crowhurst in the Diocese of Southwark. With their two daughters now of university age, Steve and Veronica have felt that God was calling them into a change of ministry, focusing on their mutual interest in the prayer and healing ministry.